Oh my goodness, it's already the end of June...time is just flying by! 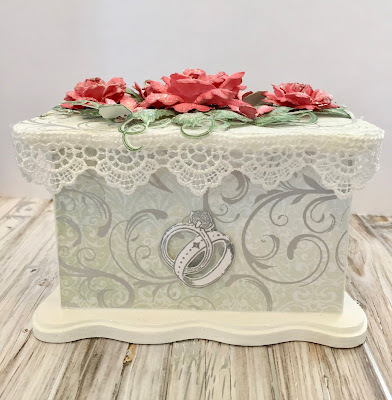 It's Heartfelt Creations Inspiration Wednesday once again and today I'm sharing a box I created to keep your rings safe when you take them off to clean, garden and all that fun stuff. The absolutely gorgeous Classic Wedding Collection is again the star of this post. 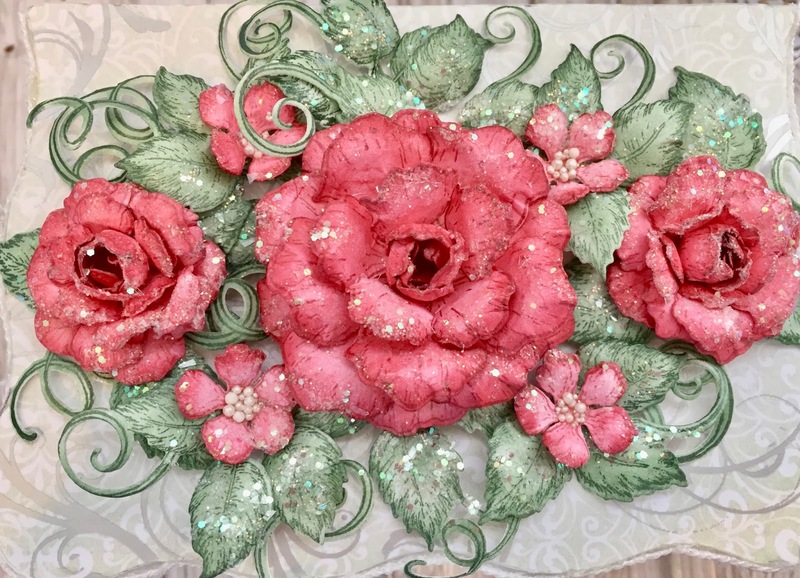 Please be sure to visit the Heartfelt Creations Blog for some wonderful inspiration from the fabulous design team members. Other Products: Pearl White Metallic Cardstock, white cardstock, Brilliance Pearlescent Ivy Ink Pad, VersaMark, Silver Embossing Powder, heat hun, Distress Clear Rock Candy Crackle Paint, Misti, Big Shot, small wooden box, sandpaper, white acrylic paint, Mod Podge, lace trim, paint brushes, dimensionals, hot glue gun. Instructions: Sand and paint a small wooden box inside and out. Cut the paper from the collection to cover the front, sides, back and top of the box. Mod Podge the entire box and adhere the paper. Stamp the rings with VersaMark on pearl white cardstock, heat emboss, shape and adhere to the front of the box with dimensionals. Cut the lace trim to fit and adhere with the hot glue gun. 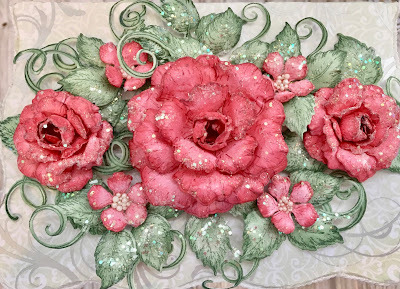 Watch this video https://youtu.be/Z8P070kC3oo to learn how to create dimensional roses with the Classic Rose Collection. Stamp the roses on white cardstock with Pearlescent Poppy Ink, color with Pearlescent Coral and highlight with Pearlescent Poppy. Die cut with the matching die and shape using the Deluxe Flower Shaping Kit. Stamp and color the rose vines with Pearlescent Ivy ink, die cut with the matching die and shape using the Deluxe Flower Shaping Kit. Paint the roses and vines with Distress Crackle paint and glitter with Rajni Chawla’s Crystal Clear. When they’re dry adhere to the top of the box using a hot glue gun. Thank you so much for stopping by...I really appreciate you! Thank you so much Susan! Hugs! Thank you so much Olga! Hugs! This takes a classic design and puts an everyday box right over the top. I love all the attention to detail here! Thank you so much Glenda! Hugs! Oh, I love your box! This is a beautiful project! Thank you for being an inspiration! Thank you so much Robin! Hugs! Thank you so much Patricia! Hugs! This is beautiful, loving this ring box. Thank you so much Shalini! Hugs! wow! How lovely. You are so creative. The ring box is just fabulous!